Alma Boutique-Hotel is located in a small, quiet alley behind the bustling Schwedenplatz Square, decorated with a touch of Viennese Art Nouveau. 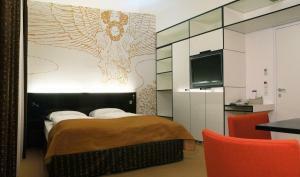 It offers free Wi-Fi and a roof terrace overlooking Vienna's Old Town. All rooms include a flat-screen satellite TV, a minibar, individually adjustable air conditioning, and an electronic safe. Some rooms have a bathtub with a spa bath. The Alma Boutique is only a few minutes' walk from St. Stephen's Cathedral, the Kärntner Straße (shopping street) and the Hofburg (Imperial Palace).